Human life has to be a constant thanksgiving. Every good thing in life is gifted to us. If we consider the magnitude of the gifts that we have received in life and are still receiving, our personal achievements are too insignificant. Even the so called personal achievements have been made possible by the benevolent support of numerous persons. In fact, we do not deserve anything in life. Everything is given, everything is gifted. We exist in a large network of relationships. We share in the existence of everybody and everything around us and all these realities constantly enrich our existence. For this reason we are deeply indebted to all these realities. Our life has to be permeated by an underlying sense of gratitude. This is what we celebrate in a very special way on Thanksgiving Day. Primarily we are indebted to God for our very life and all that it presents us. This life is a gift of God. Every day of our life, we are sustained by His loving providence. There cannot be a moment in our life when we are outside this providence; then we cease to exist. If we deeply realize this fact about our life, our life cannot but be a constant thanksgiving to God. We can never cease thanking God and gratefully acknowledging our metaphysical dependence on God. Thanksgiving Day is a very special occasion for family reunion. We owe so much to our family. We are deeply indebted to our parents who brought us to life, who nurture us, who enrich our lives with their unconditional love and with the suffering that they take on themselves on account of this love. All these are gratuitous gifts, not that we deserve them. We are indebted to our family, our brothers and sisters who prepare the context of our personal growth and who through the outpouring of their love help us to grow as human persons. We are indebted to our Church for being the home of our faith and value formation, to our religious leaders for instilling in us the love of God. We are indebted to our relatives and friends for their love and support, to our teachers for their guidance and inspiration, to our social and political leaders for facilitating a peaceful social existence for us. We are indebted to our nation and to all those who work for our nation and for our society. Our life shares in the fruit of their commitment. We are indebted to this nature and to all the natural powers. Thanksgiving Day invites us to be deeply conscious of this basic fact about our life - our fundamental dependence on God and on everyone and everything around us. On this day, we joyfully celebrate the underlying indebtedness that has to be there in human life. 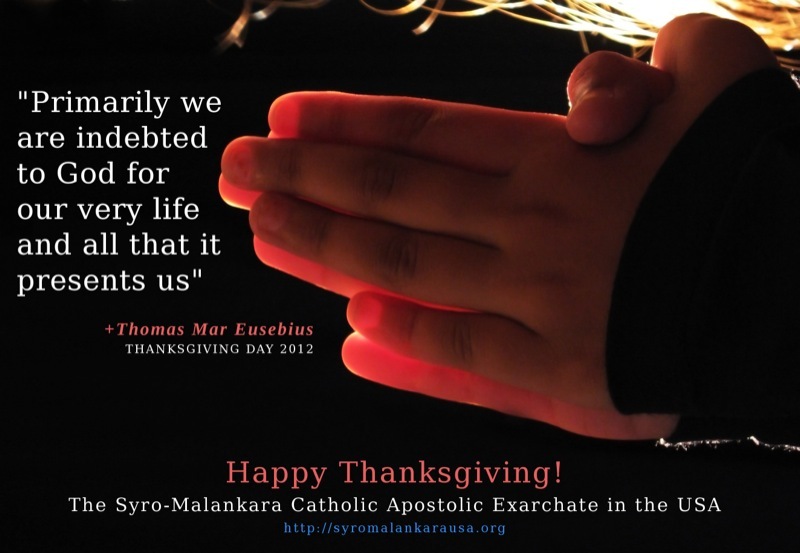 I wish all our brothers and sisters a joyful and meaningful Thanksgiving Day.